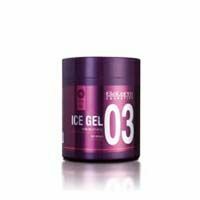 Salerm Pro-Line Ice Gel innovative ice gel In the shape of a gentle ice slush, the perfect fusion of state-of-the-art gels and the extraordinary properties of the most radical. Dare to try it! Recommended for wet look shapes according to de...sired style. Firm but not rigid hold. Protects hair while adding body at the same time. Incorporates a PSP hydrophile filmogen which traps moisture. A gel capable of creating any style. Born from a fusion of cutting-edge gels and radical styling waxes, to create the perfect balance between hold and hydration.